Byzantium is the shadow that remains of the old Roman Empire. It is a mere shadow because despite retaining the civilised ways of the Roman legacy, the Byzantines have done little to further it. In fact, it is their reverence of the old ways that has brought the empire to a point of stagnation, in a world that has gradually kept moving on. The differences between the thinking in Byzantium and the west were most profoundly highlighted with the Great Schism, the division of Christendom.Despite boasting the world's trade capital and home of Orthodox Christianity in Constantinople, the Byzantine Empire is well past its zenith and is now in steady decline. The outer regions of the empire have been slipping from the Emperor's grasp for decades now. 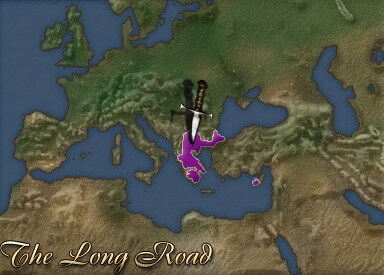 To the west, the Normans have taken southern Italy, and in the east the Seljuk Turks have moved into Asia Minor after their decisive and terrible victory at Manzikert. The latter of these two losses was the worst defeat the Empire had suffered in its entire history. To make matters worse, general corruption, chaos and dissent has lead to some of the other provinces closer to home to rebel. Arguably, the greatest threat to Byzantium lies in its independence from Rome. There is significant risk that the lords of the west will consider the lands of Orthodox Christianity to be fair game unless the Pope decrees otherwise. It is a true irony that Constantinople may now have to appease Rome after becoming the new capital of the Roman Empire centuries ago.If the Byzantine Empire is to once again become the dominant power of the east, then it will first need to reclaim its heartlands wholly before encroaching upon the borders of another power. The Byzantine legacy is long and predominantly proud, but unless the Emperor can turn things around in a hurry, it is a legacy that will soon end.